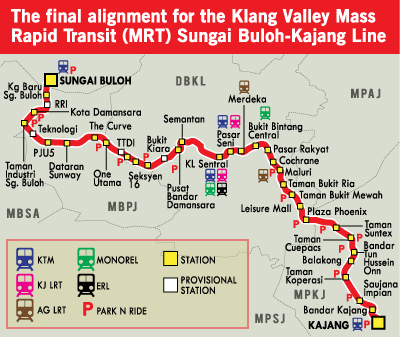 The trial closure is intended to allow MRT Corp and its contractors to study the impact of the closure on the traffic flow at SPRINT Highway (KL bound). Subsequent to the success of the trial lane closure, a permanent road closure will take place for a period of six (6) months. The closure is necessary to facilitate pipe jacking works for the relocation of utilities. 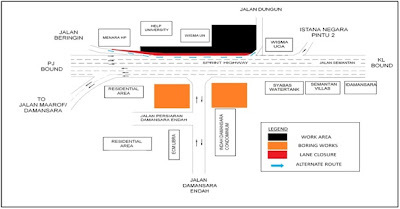 The boring works will be carried out at the former Shell and Esso stations for the construction of the foundation for Semantan Station. We apologize for the temporary inconvenience as works has to be carried out at night, otherwise it will adversely and severely impact the traffic flow at this stretch if it is carried out during the day. Your kind understanding and patience is much appreciated as we build the MRT for our future betterment in improving KL’s public transport system.